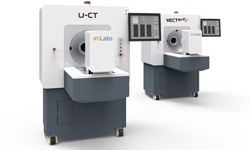 MILabs’ integrated Adaptive X-ray CT, extends the role of CT beyond co-registration of hybrid images. With the finest resolution, the lowest dose, and fastest acquisitions in the industry, MILabs X-ray CT adds many diagnostic capabilities to your molecular research. The MILab’s preclinical imaging instruments are the only instruments capable of field upgradation to PET, SPECT, bioluminescence, and fluorescence, including NIR & Cherenkov imaging. Best resolution, highest speed and lowest dose for in vivo imaging, plus scaleable to image small specimen as well as larger animals including rabbits. In addition to high-performing U-CT, comprehensive OI capabilities include fluorescence, bioluminescence and Cherenkov imaging which allows you to translate your in-vitro and ex vivo research to an in vivo system with fused optical and/or nuclear capabilities.